Smooth and quick can describe this SSK for the turbocharged N54 powered 1 series and E9X 3 series. 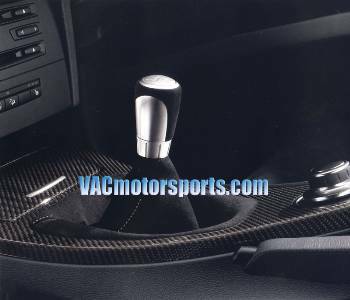 BMW has taken OEM equipment and tailored it to perform the way a VAC customer would expect. All with factory warranty in tact, serviceability and standard install. This kit can be installed by the dealer, or any qualified tech. The BMW Performance Short Shift Kit upgrades the shift lever, knob, boot and gearshift arm, shortens the shift throw by roughly 25% and delivers a more direct shift feel. Styled in black Alcantara® and polished metal, the ergonomic Performance Short Shift gives you more concise control over your engine along with a crisp, satisfying, no-nonsense motorsport feel.